If the term "cleanse" makes you think of drinking gallons of lemon water or wheatgrass juice (or maybe you associate it with deprivation and feeling hungry), you're in for a pleasant surprise. A variety of delicious and satisfying foods have natural detoxification properties, and incorporating them into your diet can cleanse your body and boost your energy. 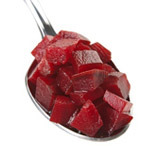 Beets stimulate the function of the liver cells and encourage bile flow, both important for detoxification. Beets are also rich in magnesium, iron, and zinc, which help remove toxins. Cilantro is a detoxifying powerhouse. Studies show that it helps facilitate the excretion of mercury and lead from the body. As for other herbs, basil contains nutrients that support the liver, and garlic's high sulfur content stimulates the production of glutathione, which is needed for liver detoxification. Parsley helps improve kidney function, and ginger can help eliminate waste. Go nuts with kale, chard, or any dark green leafy veggie. They contain phytonutrients known to help protect against free-radical damage in the body. Greens are rich in chlorophyll, which helps rid the body of environmental toxins, heavy metals, and pesticides. Broccoli, cauliflower, and Brussels sprouts are rich in sulfur, which is needed for liver detoxification. These veggies are shown to speed the elimination of environmental toxins from the body.